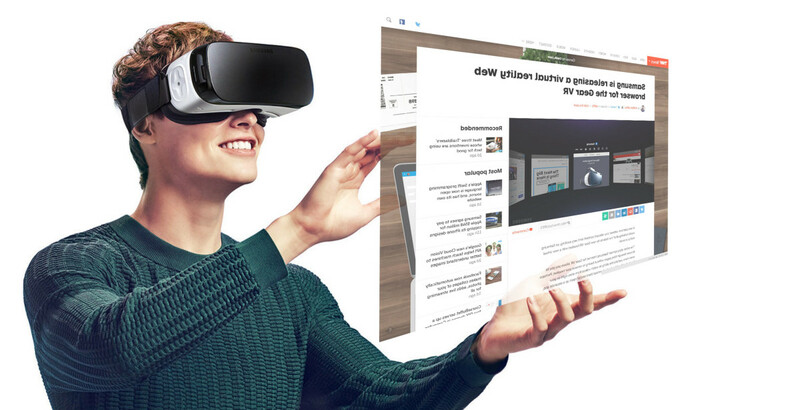 Of all the things to be excited about regarding virtual reality – gaming, 360-degree movies, and all sorts of cool new experiences – the last thing I expected to intrigue me is a virtual reality Web browser. Yet after trying Samsung’s new browser made for the Gear VR, I think it might ultimately end up being one of the platform’s most useful tricks – even if it’s extremely limited at the moment. It’s like Web browsing in ‘Minority Report’. Tabs are presented as floating windows around you, and you simply shift your head slightly to look at another tab. In fact, it feels a lot like a multi-monitor set-up, except you probably can’t afford or have the space for five 40-inch monitors. Navigating around is relatively simple. You scroll using the Gear VR’s touchpad (I didn’t have a game controller with me), and URL and search input defaults to dictation. Voice recognition works really well, but you can also type in an address by moving your head around and tapping on the touchpad. That sounds more cumbersome than it actually is, since Samsung’s motion tracking is excellent (think typing with a mouse or stylus). Not ideal, but it works. One practical benefit of having the browser is that you can use it to watch 360-degree videos on YouTube; the standard YouTube app -which now supports Google Cardboard – doesn’t work in the Oculus OS layer, but the Web interface provides an essentially identical experience. Everything runs surprisingly smoothly too, despite the extra rendering my S6 Edge+ has to do for the 3D interface. The app itself is pretty barebones in terms of functionality at the moment though. You can’t import bookmarks, but there’s no way to adjust settings like cookies or default to using desktop sites. My bluetooth keyboard didn’t work while browsing either, which is a shame, as it would have been nice as a distraction-free writing interface. The pixel density on the Gear VR is also too low for what we’ve come to expect from our devices for sharp text- it’s usable, but feels like working with 1024×768 panels. But despite all those qualms, the possibilities are still enticing. Once the specs, features, and peripheral support have caught up, imagine being being able to make your computer screen any size you’d like and having as many of them as you need. Perhaps even better: you could easily turn off a distracting environment to zone into a task. Right now, browsing on the GR VR is more of a nice-to-have feature than something that could change the way you work. But if it’s any indication of what’s to come, then the future looks pretty awesome.